Are you a representational painter who would like to shake up your work? Are you a non-objective painter afraid to push your boundaries and really cut loose? Does the blank white canvas, panel or paper cause you to freeze up? Are you a first time painter or someone who hasn’t picked up a brush in years? I will guide you through a series of structured, loosening up exercises, using both painting and drawing tools to help you with these issues. You will work rapidly, intuitively, and expressively, gaining confidence in your artistic choices. We will explore different ways of mark making to give your paintings a unique signature and consider the creation of harmonious color palettes. There will be free painting time for you to experiment with the tools I have shown you. Those who desire will have the space and opportunity to paint large! Bring your artistic passion, the willingness to try something different and gain a new perspective on your creative process. All levels welcome. Explore and develop your personal voice in the inspirational environment of Santa Fe. Through a series of guided exercises we will cover composition, color, value and how to work on multiples at the same time. Find your own signature with different mark making tools and learn how your marks enliven your paintings. You will learn how to harmonize any palette, move from analysis paralysis to painting success and to trust your artistic choices. There will be plenty of time for independent exploration. This intensive 3 day workshop is for all levels of artists who have experience using acrylic paint. At the end of day 3, join us and fellow artists for a no host dinner to celebrate your success. 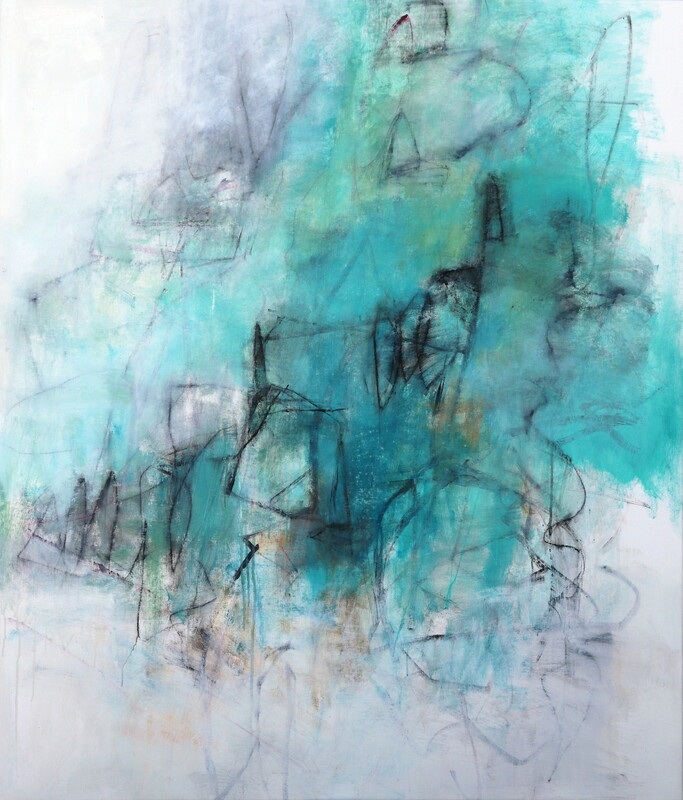 Cat Tesla is an award winning international artist with gallery representation in the U.S. and U.K. She provides a unique perspective to abstract painting in a supportive environment. Formerly a genetic counselor, she has been a professional artist for 22 years. Have you been wanting to push your envelope and paint just a bit larger but haven’t done it yet? This Intensive workshop might be just perfect for you. You will learn techniques to make larger images than you have before. This workshop is a combination of guided exercises and independent study. In a supportive environment we help you set your intentions, encourage experimentation, and demonstrate ways to bring your heart’s desire to fruition. This workshop is for intermediate and advanced students or artists who would like time to do independent study in a creative art space. Come enjoy Sonoma Wine Country and the beautiful vineyard views in Suzanne’s new Dream Studio–Studio 4404. Go wild with us! Bring your courage, your curiosity, your love of creating for this 4-day intensive abstract acrylic workshop. This workshop is chock full of learning, exploring, delving, trusting, getting wildly creative. You will be guided in a series of structured loosening up exercises, using acrylic paint and a variety of drawing tools in the creation of nonobjective abstract paintings. You will gain courage, build trust in your artistic choices, grow your skills of design, explore your own inner painting language and nurture your creative spirit. You will explore tools and marks and how your signature marks enliven your paintings. Plenty of free painting time as well. Come prepared to rediscover Santa Fe, the art of play and tap in to your inner wildness! All levels welcome. Julie’s spacious art studio is located across the street from MeowWolf. Sign up for workshops, or let me design a custom workshop for you or your group. Do you have a group of artists wanting to take a workshop together in your city? Use the form below to contact me with your location and group size for pricing. I am also available for private instruction. Let me me know what dates and times are best for you. I will contact you for payment information and to answer any questions you have. You may cancel 30 days or more before the workshop for a full refund. Julie’s workshop was informative, inspiring, and helped build my confidence and momentum–which was exactly what I needed. I enjoyed learning the loosening up techniques to help get started when faced with a blank canvas and not sure where/how to start; and also had fun exploring with new paint and drawing tools that produced surprisingly great results. The walking tour of galleries, experimenting with color and painting large were additional highlights of the weekend. Julie is a wonderful guide, a gracious host and very generous in sharing her extensive knowledge. I loved getting wild and re-igniting my creative spirit. Look forward to taking another workshop soon! I did Julie’s Abstract workshop in May and had the most wonderful time. The space was an artist dream workspace. She introduced us to new tools and new techniques which helped push me to explore my art making in a new way. Julie was an informed and encouraging teacher. And a pleasure to get to know better as I have long been an admirer of her work. I recommend her workshops with highest acclaim! “Fortunate indeed are those who take a class from Suzanne Jacquot and Julie Schumer. This is not the usual experience, where there is normally one platform, or one focus. They both have crafted, as a team, new approaches to content: tools, colors, size, composition. Yes, these are the “under layers”, just like any other class you might have taken. But it goes far beyond that.